The 20,000 Feet is the ultimate professional diver instrument and is water resistant to a world record holding 6,000 metres (20,000 feet). Dimensionally the timepiece exudes massive proportions and has a 46mm x 28.5mm titanium case. What makes this timepiece so unbelievable is the level of finishing and build quality. The yellow dial works in perfect contrast with the white numerals, raised indexes and red/black sub counters. Other impressive details include a rotating black bezel Incabloc shock absorber, titanium bracelet and anti-reflective sapphire crystal lens. Beneath the durable façade lies a COSC chronometer-certified self-winding chronograph Valjoux ETA 7750 mechanical movement. This Caliber comprises 25-jewels and oscillates at frequency of 28,800 vibrations per hour. 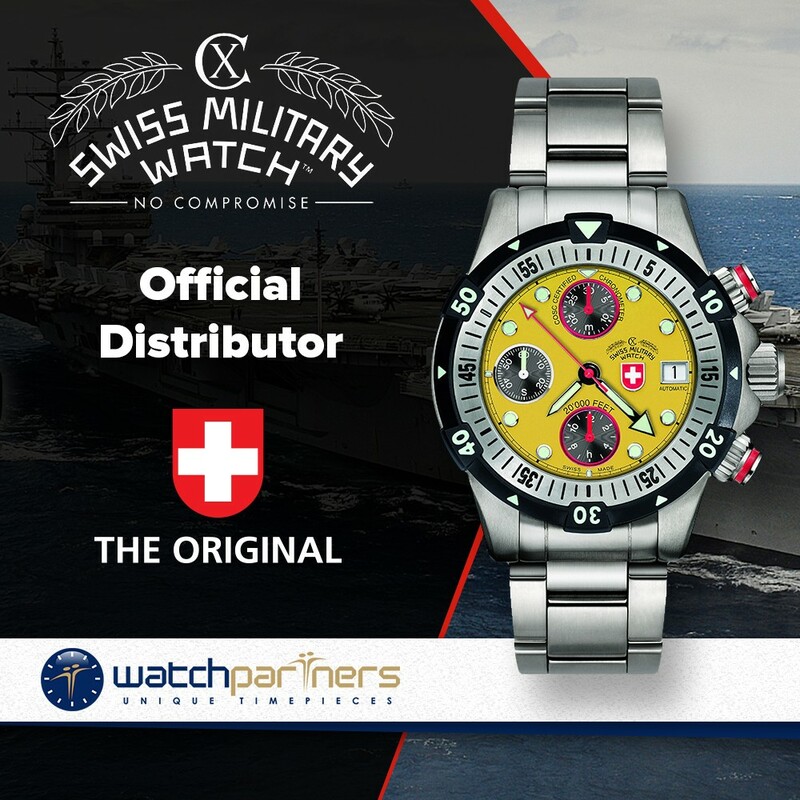 The 20000 FEET WORLD RECORD CX Swiss Military Watch™ is known for its uncompromising attention to the functionality of their timepieces – their watches are not accessories, but instruments the professional can rely on. 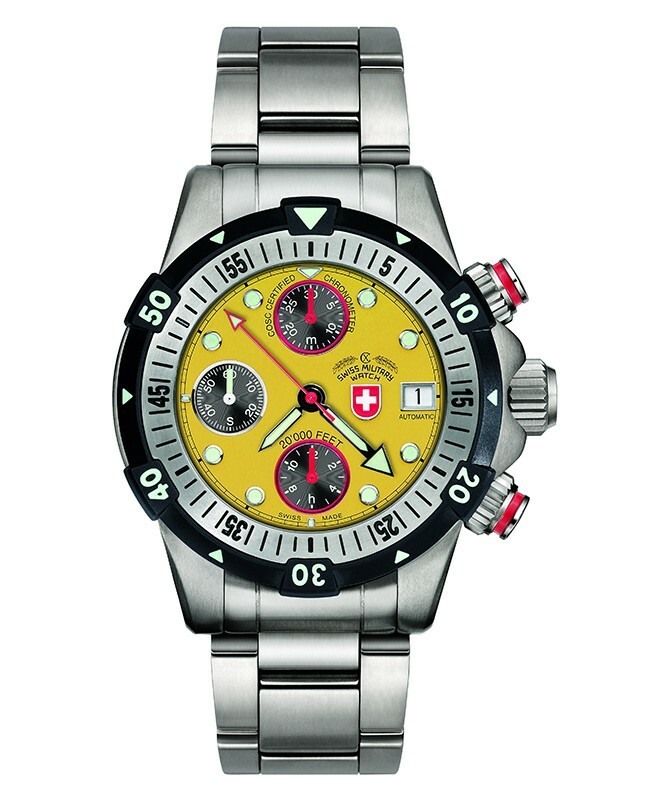 With the 12’000 FEET CX Swiss Military Watch™ held the World Record for water resistance of automatic diving watches from 2005 to April 2008 with a water resistance of 12’000 feet or 3’657 meters. At the BASELWORLD 2008 Rolex™ presented their Sea Dweller Deep Sea, a three-hand diving watch water resistant to 3’900 meters – a new World Record which is now about to be obliterated: at the 2009 BASELWORLD CX Swiss Military Watch™ presents the 20’000 FEET with an incredible water resistance of 20’000 feet or 6’000 meters, winning back the world record by a 50% margin and reintroducing CX Swiss Military Watch™ to the Guinness Book of Records. The 20’000 FEET by CX Swiss Military Watch™ has thus reached a new, hitherto unthinkable dimension for diving watches – the challenge of the abyss was met by combining state-of-the-art technology with a highly innovative approach and a dedicated team of watchmakers & engineers. World Record for Automatic Diving Watches! But not enough – in order to comply with ISO norm 6425 we constructed the watch to be water resistant to 7’500 meters, resulting in the required 25% safety margin and annihilating the old world record of 2008 by an impressive 50%. The 20’000 FEET is available in four dial colours and in a limited edition of totally 1’000 timepieces only. very good Review by Earl H.